Can a popular trend be making my cat sick? The truth about essential oils and your cat. Although they’ve been around for decades, essential oils have become very popular of late. I’m not here to debate the potential human health benefits of these products, but to inform you that, yes, certain essential oils are potentially harmful to your cat. The same goes for certain liquid potpourri products as well. They make me feel good. Why are they bad for my cat? Many of these hydrocarbons and terpenes are toxic for felines and can be quickly absorbed by your cat- in three different ways. Orally, via the dermis (through the skin) and yes, even by inhaling them. You may think that inhalation of the scented air is no big deal. Unfortunately, it is. When the diffused oils become ‘aerosolized’ and are inhaled by your cat, they eventually make their way into the bloodstream through the lungs. From the bloodstream, into the liver. Once it reaches the liver, the problems start. More on that in a moment. I’ve read recently about a case where a devoted cat parent thought putting an essential oil diffuser near their cat’s litter box was a good idea to help eliminate litter box odors. Unfortunately, the cat was being bombarded with the oils. The oils were being ingested by the cat in three ways- as an inhalant, and through both the skin and the mouth by grooming. Sadly, the cat was unable to recover from the toxicity and passed, despite quick action by the owner and veterinarian. Your cat’s liver is not like ours- or even that of a dog’s. They serve the same purpose, but cats lack certain liver enzymes that metabolize these products. Where humans, dogs and most other animals can rely on our livers to remove these things and detoxify us, cats just can’t do it. 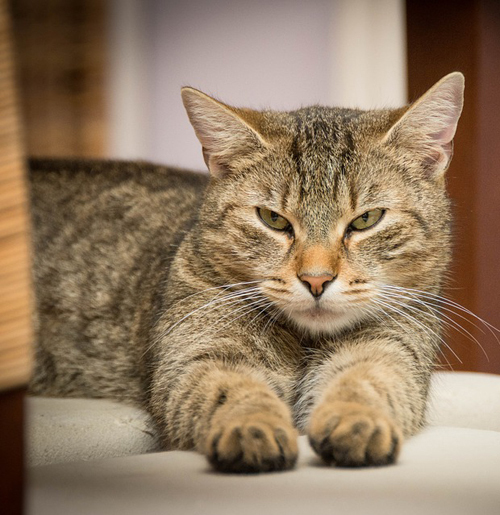 The result is the buildup of these chemicals in your cat’s system which can cause permanent liver damage and potential problems with the kidneys, too. Are all oils dangerous to my cat? Please note that this list is in no way all-inclusive. Depending on the manufacturer of the oil, and other compounds that may be added to the liquids, there is the possibility for adverse reactions by your cat. I love my cat, but I also enjoy the benefits of my essential oils. What can I do? Limit, or better yet, eliminate your cat’s exposure to essential oils. 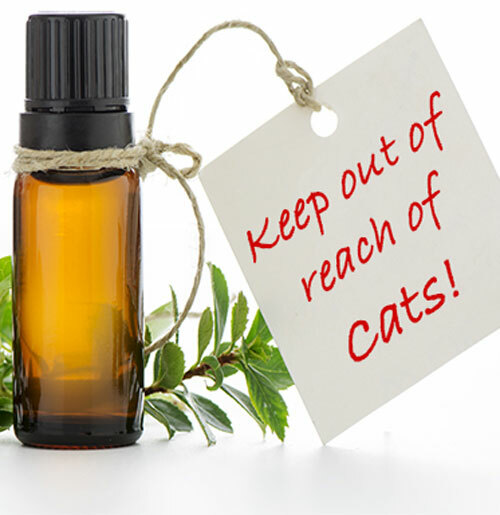 Try to only use essential oils in certain areas of the house that are off limits to your cat. I know it is sometimes difficult to do, as cats are naturally curious, and always seem to want to go where they’re not supposed to. Keep all oils out of reach of your cat at all times. This includes the liquids, diffusers and any related products that come in contact with the oils. What are the signs of essential oil poisoning in my cat? It doesn’t take much oil to make a cat sick. A drop or two, or as little as a lick- depending on the product. I suspect my cat has ingested essential oils, or has had exposure- what should I do? Contact your veterinarian immediately. Put the product along with any packaging into a plastic bag and take it with you to the veterinary hospital. If you suspect that the oil has made contact with the pet’s skin or coat, wash it off with liquid dishwashing detergent. Your veterinarian will likely want to perform bloodwork to determine if any damage to the liver or kidneys has occurred. Other treatments and medications may be recommended depending on the type of oil the pet has come in contact with. If your veterinarian’s office is closed, consult an emergency veterinary hospital or the pet poison helpline at 800-213-6680. I’ve read elsewhere on the internet that essential oils are safe for my pets- now I’m confused. The internet is a great resource, and for every reliable and trustworthy website out there, there’s at least one that will contradict it. In no way am I saying that all essential oils are harmful- but many are, and it is my life’s work to help you care for your pets. It is always best to speak with your veterinarian before using them in your household, and definitely before using them directly on your pet. Thank you very much for this. The knowledge complicates my life a little right now, but I’d rather keep the cats safe. I’ll find some way to use the specific oil I was relying on that doesn’t endanger them.